Today I’m going to talk about control pads. Specifically, third-party controllers for the SNES, because when I was a kid I had a SNES that only came with one official controller and I also had two younger brothers who were not exactly gentle with our peripherals. One of them took our NES Zapper in the bath with him, for pity’s sake. So, over the years I was “fortunate” enough to try out quite a variety of third-party SNES pads. I’m sure many of you will share this pain – there’s a reason that “I went to my friend’s house and they made me use the crappy non-official controller” is up there with “blowing on the cartridge” in terms of shared videogaming memories. Well, I was that friend with the crappy controllers. I apologise to everyone that had to suffer through Super Mario Kart this way. Let’s start with the pads I actually owned, and this was one of them: the SN ProPad. It’s actually… not bad? That’s how I remember it, anyway, and when an official SNES controller wasn’t available this would be the one I’d go for. It’s pleasingly chunky, durable at a time when the potential anger generated by two-player Mortal Kombat matches meant that durability might be an issue, and as I recall the d-pad was decent, too. The d-pad is so often where these controllers fall down, but I definitely put a lot of hours into Super Street Fighter II with this pad and didn’t suffer for it. However, the most notable thing about this pad is just how incredibly 90s it is. It could have come from no other decade. The overall shape of it, the transparent plastic casing and most of all the colours of the buttons, colours so much of their time that if the 1990s had an official flag, it would be rendered in those hues. Yeah, something like that. In an alternate history where Nickelodeon representatives colonised Mars in 1993, that’s the flag they planted at the future site of New Gak City. There were versions of this pad where the buttons were the same primary colours as on an actual SNES controller, but I’m sure we can all agree those are clearly inferior. On the opposite end of the scale is this depressing lump of grey misery, which I also owned. Owned twice, even: I had one as a kid, and then years later – I’m talking early-to-mid-2000s, long after the SNES’s heyday – I saw them for sale in a pound shop. Boxed, brand-new Competition Pro SNES pads for the incredible price of one of your English pounds. Obviously I bought one, on the off chance it was an artefact that had somehow travelled here from a parallel dimension. It wasn’t, it was the same old not-very-good SNES pad I’d used as a kid. I recall the d-pad on this one being particularly bad - spongier than a Mr. Kipling factory, frankly - as well as the little turbo-fire switches being both very stiff and quite sharp. Speaking of the turbo-fire switches, you might notice that there’s one for slow motion. Given that some of VGJunk’s readership is bound to be too young to remember, I should explain how this switch worked: it was just a turbo button for Start. In most games, the Start button is pause, so to achieve a “slow-motion” effect the game would rapidly pause and unpause. It rarely worked well and sometimes didn’t work at all, but its best use was in the original SNES version of Street Fighter II. For some reason, Capcom made the decision to include a sound effect that plays when you pause SFII. “Sound effect” doesn’t quite cover it, mind you – it’s a sample of someone shouting “Hoh hoh hoh hah hah hah!,” plus a cymbal crash at the end. When you unpause, it says “fight!” So, playing SFII using this slow motion function means you’re launching hadoukens and sonic booms while a constant stream of “ho-fi-ho-fi-ho-fi” assaults your ears. On top of that, this SNES pad is the same shape as a Megadrive pad. You’d think there’d be laws against that kind of thing, or if not laws then at least widely-held social taboos that should never be crossed. I assumed that the reason for this pad’s shape was that there was also a Megadrive version of the pad and the manufacturers were trying to save time and money by re-using the same shell, but while there is a Megadrive Competition Pro pad, it’s a different shape. 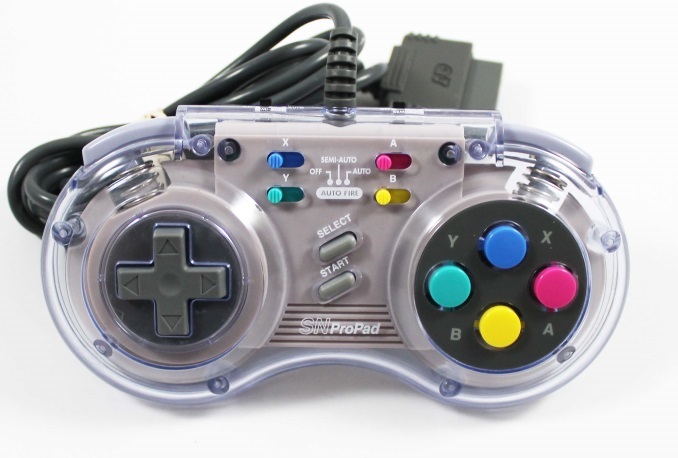 Oh man, I’d forgotten about this one until I started looking up SNES pads. Another controller that I used to own, the Tecnoplus is certainly a game pad. Yep. That’s all you can say about it, really. 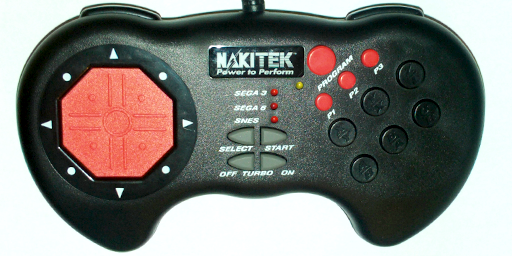 It’s utterly forgettable, the very image of a generic videogame control pad. 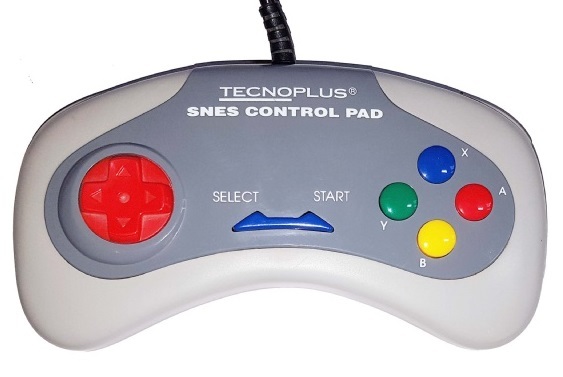 Like, if you needed to draw a controller, possibly to advertise the videogaming section of your online shop, there’s a decent chance you’d just end up drawing the Tecnoplus. On closer inspection a couple of details do reveal themselves. One is that the d-pad looks horrendous, which I’m sure it was but obviously I can’t remember because the Tecnoplus pad is so dull it defies the human mind’s attempts at memorisation. The other is that the start and select button have been fused into one unit. That way you only have to make one button. It’s efficient, you see. 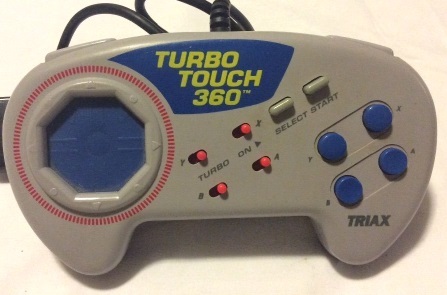 Fortunately I never owned a Turbo Touch 360: unfortunately, one of my friends had the NES version, so I still had to use it a bunch of times. Clearly this controller’s main gimmick is in the d-pad region, where the familiar cross-shaped button has been replaced by an octagonal patch of rubber I like to call the Zone of Failure. The idea behind the Turbo Touch 360 was that the d-pad is replaced by a series of touch-sensitive, erm, sensors, with the aim of creating a control system that requires less physical force to interact with. Makes sense to me, many’s the time I’ve felt the embarrassing glare of my doctor as I explain that I’ve fractured my thumbs yet again by smashing them into the SNES’s unyielding, implacable d-pad. Okay, maybe that’s a little harsh: apparently the Turbo Touch was endorsed by a surgeon specialising in sports injuries, and I could see this pad being an option for some people with reduced manual dexterity. Sadly, that doesn’t make the Turbo Touch good, and as I recall it has only two states: ridiculously over-sensitive or completely unresponsive. Triax tried to reinvent the wheel and ended up with a sack full of bricks. I’m not sure whether the controller pictured above is using the same capacitive sensor technology as the Turbo Touch or if it just has the worst d-pad mankind could possibly conceive of. That’s not important, though – the shocking twist with this one is that you can use it on both the SNES and the Megadrive or Genesis! That’s incredible technology right there, but there’s only one drawback: who is this meant for? What kind of mad billionaire owned both a SNES and a Megadrive during their peak years? Maybe it’s just a British thing, but I don’t think I knew anyone who owned a SNES and a Megadrive at the same time until years later when they began collecting retro stuff, not even that one rich kid who got every Nintendo console on release day. Sure, it might look like something Batman knocked up so he could play emulated games on the Bat-Computer, but I have to question its overall usefulness. Here’s another one that I didn’t actually own but I certainly used at some point: those scalloped shoulder buttons are dredging up some long-submerged memories. 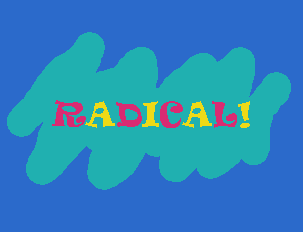 We’re back to the most nineties of colour palettes with this one, and on the whole it looks like someone strapped Picasso into a machine that blasted Super Soaker commercials into his face for a week, then kicked him out of the booth and ordered him to paint an angry owl. This one also seems to have a hole in the d-pad where you can screw in a little plastic nub, turning it into a mini-joystick. I don’t think I ever used a “joystick” like that. Here’s a shocking fact about me: I’m not very good at games that use joysticks, especially fighting games. I much prefer using a d-pad for them, and I’m too old to learn how to use a fighting stick now. Okay, not old. Stubborn. Yeah, that’s it. 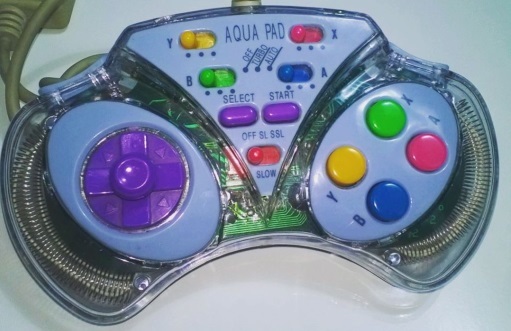 It appears there was a variant of the previous pad called the Aqua Pad. Isn’t that where Aquaman moved after his divorce? Anyway, the Aqua Pad. It sure is something, and that thing is specifically springs. Why does it have those massive springs in the side? I assume they work with the shoulder buttons, and I’m no videogame control pad engineer but they seem comically oversized to me. If you dropped this pad on a hard surface, there’s a good chance the shoulder buttons would fly off with enough force to punch through six inches of reinforced steel. Finally for today, we’ve got this mad thing. I’ve had some kind of connection to most of the other pads I’ve mentioned, but it pains me to say I have never had the pleasure of using the Beeshu Jet Fighter controller. I couldn’t not include it, though, because look at it. 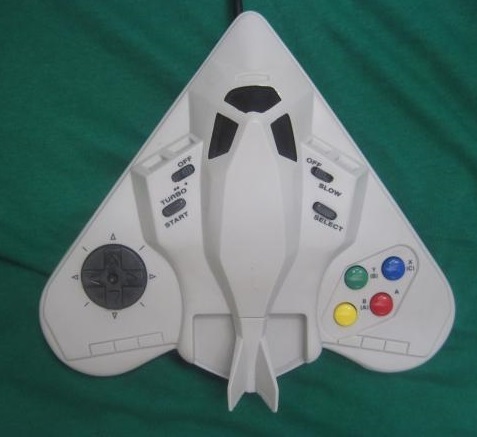 More people should be made aware that there’s a SNES controller shaped like a stealth fighter, and if I can be a part of spreading this good news then that makes me feel all warm and fuzzy inside. It must surely be an absolute nightmare to use, but on the plus side if you’re the kind of person who throws their controllers when they get frustrated with a game then the Beeshu could probably travel about four hundred feet with enough air under its wings. Don’t throw your controllers, though. Breathe deeply, relax, see your failures as a path to eventual success. Unless you’re using that Competition Pro pad; in that case, go nuts. High-speed smash-em-up Lethal Crash Race! The miner's strike and Trotsky's grave in Toilet Truble! TV station management sim Telly Wise! Nice. I still have my boring normal-colored SN ProPad. If I remember correctly, the only game that sort of worked with the "turbo pause" function was Earthworm Jim, and even then it looked weird due to the picture dimming when paused. The colored buttons on some of these are based on the Japanese Super Famicom controller. Performance and Aqua Pad mix up the layout, though. Actually, he's british, and the european Super Nintendos came with the same Skittles-sposored controller. The official colors are solid primaries, though, not the pastels he's mocking. I had one of those Turbo Touch controllers and I can confirm they're terrible. They basically put me off buying 3rd party controllers from then on, which is just as well. True story: I bought a used TurboTouch years later, just for the infamy. They ARE pretty awful. BUT! The capacitive sensors they use to detect your thumb(poorly) are a crude predecessor of something many use every day, as the laptop trackpad uses an array of (much smaller) capacitive sensors doing the exact same finger-tracking job with far higher resolution and reliability. So the next time you use a trackpad, remember it is the grandchild of the TurboTouch. You're too mature to mention that the SN Propad was released by STD Manufacturing... but I'm not! This sort of thing is why I made sure to always carry a controller with me when I went to anyone's house. Unless it was a Sega system because up until Dreamcast I only had Nintendo consoles. I actually had both an SNES and a MegaDrive/Genesis when I was growing up. Rather, the SNES was mine, and the Genesis was my brother's, in a time where we both lived in the same room. Given how little he used the thing, it effectively meant that the Genesis was mine, and it simply BECAME mine once we moved into a new house that let us have separate rooms and he'd stopped caring about it. ...I type this and now I realize that there may be a reason why I had to get my own Playstation a year after he got his. The SN ProPad reminded me of one of my worst purchases ever: The Logic 3 Sprint Pad 16. An abomination that tries to be a SNES pad and a Mega Drive pad in the same shell. I guess it wouldn't be that bad with the SNES (at least it feels solid - for some reason, transparent gamepads always felt more sturdy than their regular-colored versions), but if trying to fit the SEGA 6-button gamepad in the same shell as the SNES would be difficult, they took an extra step to make it harder and decided the C button should be a shoulder bumper, not one of the other two face buttons. A SNES pad shaped like a genesis with six face buttons would have worked well.